Notes: Continuation of the storyline of the Card Captor Sakura TV series. Kinomoto Sakura is in 6th grade, and she and her class are rehearsing for the upcoming Nadeshiko (pink flower) festival. Li Shaoran has come back from China, and Sakura finally sees an opportunity to express her feelings for him. Mysteriously, though, Sakura's cards have started disappearing, and a phone call from Eriol reveals that Clow Reed left behind one more card - a card with the power to destroy them all. Is it just me, or does CLAMP really love putting Tokyo in mortal danger? First, X, then the Rayearth OAVs, and now, Card Captor Sakura. Yikes! Fortunately, since Card Captor Sakura is significantly lighter in content than most of CLAMP's other works, what we get here is more of what we find in the TV series and the first movie - a well-plotted and well-executed anime. While the idea of "more of the same" usually implies repetition and stagnation, this movie is neither repetitive nor stagnant. Rather, this is one final, grand adventure with Sakura and her friends. The one major sticking point I have with this film is a relatively simple one - most viewers will be pretty lost without the context of later episodes of the TV series. Eriol, for example, is a fairly important accessory character who doesn't arrive until fairly late in the continuity - and knowing his backstory is integral to understanding what's going on, and why. Certainly, this is no place to start watching Card Captor Sakura, but that's sort of like telling someone not to start a book with the last chapter. This is obviously a sequel, so it would be silly not to consider this within the context of the franchise. But how does it hold up? Pretty damn well. 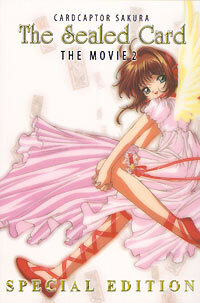 The plot is somewhat meatier than the first movie, with the dual threads of Sakura's internal sentiment and the mystery of the final card being woven together will in a story that, while fairly sentimental, gets in more than enough action to be quite exciting, while tying up the Card Captor Sakura story in a fashion that's appropriate and sweet. Musically, it's pretty good, with orchestral swells in the right place, and a fun pop song at the end. The animation is excellent during the action sequences, though it still relies on the typical shoujo manga devices for a lot of other scenes. Generally, the best part of this series is Sakura herself - it's good seeing take that next step towards growing up, and the ending is just super, super cute. The bonus short with Spinel and Kero-chan chasing around an octopus ball (tako-yaki) is so incredibly cute and funny that it almost merits its own review. It's just great. While I advise any prospective viewer to wait on watching this until you've gotten well acquainted with its prerequisites, I can assure you that the wait is worth it. This movie is a fitting, sweet end to the Card Captor Sakura anime franchise, and it's right up there with the best of CLAMP's work.